I'm still working to complete the Soul Art Certification program that I enrolled in almost 2 years ago. Completion is oh so close. It's been an amazing path. In taking many journeys myself, as well as starting to lead others on their own journeys, I've become deeply familiar with the process, the little nuances of each step, and I completely adore it. Recently I finished a Soul Art Journey of my own. It was incredibly powerful! In a previous journey I learned that in order to be comfortable being seen, I need whole self acceptance. That became my focus for this journey, living from a place of whole self acceptance. 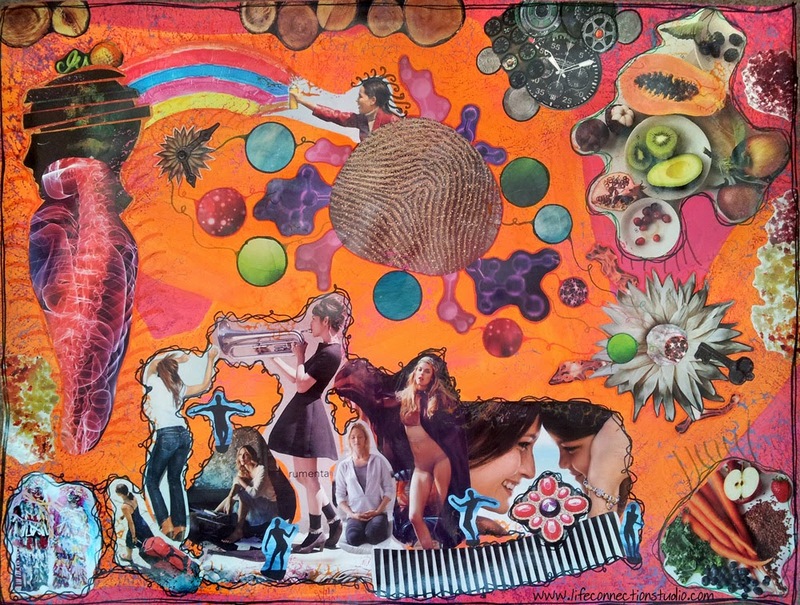 Keeping my intention in mind and staying very intuitive and open to the whispers of my inner voice, I created the above collage piece. It's very different than most of my art but it speaks to me nonetheless. I need to BE whole to have whole self acceptance. We all have so many parts to us, so many titles, so many different aspects of ourselves. I realized that some of my parts weren't working well together let alone aligned to be a whole person. I have light and dark parts and they need acceptance between them. I needed to integrate these parts of myself so I could move forward more efficiently. Shortly after this insight came to me, Sarah, a good friend of mine and a health and life coach from Nourish Your Roots, told me about a method she uses with her clients to do just that, integrate parts of yourself. Perfect! With her help, I found that I have a spiritual side of myself that is all about higher connection, inner connection, life purpose, etc and then I have another side that is all about play, desires, enjoyment of going out and having fun, connection with others. These two parts were in opposition. I know that it comes from my religious up bringing. In order to truly be a spiritual religious person I was taught to stay away from anything sinful or evil. You would think that would encompass just things like killing and stealing but no, dancing, piercings, painting your toenails, jewelry, drinking coffee or wine, and more were all included in the "sinful" label. I've done a lot of work to free myself of those restrictions but found I still had a bit deeper to go. In a deeper look at these two parts, I realized that they encompass what I feel life is all about: bridging the the energetic spiritual realm with the earthy physical realm. I deeply feel that we are little energetic bits of the Universe, star dust Spirits, who've come to earth to experience and enjoy all we can in this physical form, then to be an anchor of sorts to bring that higher energy into the physical. Sarah, guided me in defining these two parts of myself, seeing what both parts had to offer the other, and building acceptance between them. After a couple weeks of this cultivation, I was amazed at the results! I felt more clarity and alignment in myself, my life, and my purpose than ever before. I felt energized. My creativity burst open and my confidence to pursue big life goals soared. This alignment has also brought me to a much more solid place of self acceptance that enables me to move forward with ease! I am beaming with gratitude to be on this amazing life journey! Here's the aftermath of my first guided Connection Art, intuitive art session! Seeing my client go from timidity to confident creative exploration makes my heart soar!